"...We were traveling once down a road and we were strafed by a German plane. The driver and I dove under the vehicle. I didn't see how close it came, and I didn't want to know..."
Jim spent almost a year delivering messages for the Army in Germany near the end of WWII. During his trips of up to 10 miles from Army headquarters to the German area, Lockshin said he never needed to know the contents of the messages. "They were classified," Jim said. "I just wanted to get them to the front." It wasn't just messages. A variety of supplies were given to the GI who had to navigate dangerous territory "armed" only with a driver and a weapon. "I was nervous, but we were able to remain safe," he said, adding he once narrowly escaped a strafing by a German plane. The close call he remembers: "We were traveling once down a road and we were strafed by a German plane. The driver and I dove under the vehicle. I didn't see how close it came, and I didn't want to know. I learned early on in my service to identify planes. That helped save my life." Jim did not escape the war unscathed however, In early 1945 he was involved in a truck accident. "I was out looking for a friend of mine and was hit at 35 mph. I thought 'What a dummy' I could have avoided it. I wasn't looking at the time." He was sent to France and England for recovery, where he found that a nurse was his dad's cousin. "That really made my recovery so much easier to take. She was nice." Lockshin was reunited with his Ozark friends in Heerlen, Netherlands in 1989. He served as vide-president of the Association in 1997 and was president in 1998. "I liked my military service and appreciated what I could do for my country," he said. 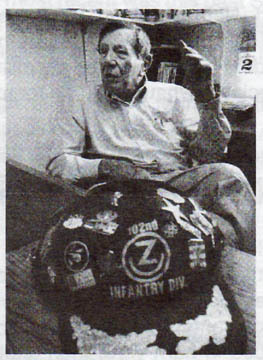 The above story, "World War II Experiences", by James Lockshin, SIG, 102nd Division, was originally published in the 102d Division "Ozark Notes", Vol. 57, No. 3, April/June 2005, pp. 13-14.